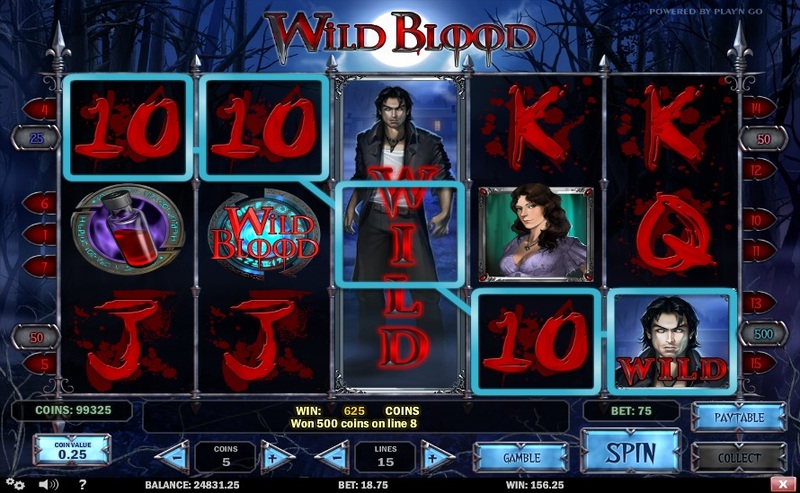 Wild Blood is a vampire-themed PlayNGo slot with a top jackpot of 2,500 coins, re-spins, expanding wilds, and bonus game. Playing this 15-line slot is as easy as playing any other slot because it is based on standard slot rules. Players should first activate the number of paylines they would like to play by clicking on the plus or minus marks on the Lines option. The next step is to select the number of coins they would like to play by clicking on the plus or minus marks on the Coins option. Players can bet up to five coins per active payline and select from coin values such as $0.01, $0.02, $0.05, $0.10, $0.20, and $0.25. If they wish to bet maximum, they only have to hit the Bet Max button. Players can bet a minimum of $0.01 to a maximum of $18.75 per spin of the reels, which makes Wild Blood an affordable slot considering the fact that it has a top fixed jackpot of 2,500 coins for players to grab. The graphics, imagery, audio effects, and ambience music of Wild Blood suits its vampire theme very well. Set against the backdrop of a moonlit night, the dark reels of this slot feature high-value card symbols designed in blood. In addition, there are thematic symbols of scary-looking male and female vampires. If players love the vampire theme, this slot will definitely give them value for money. Wild Blood comes with four bonus features—re-spins, the Blood Bonus game, scatter wins, and gamble game. If players get the expanding wild symbol on the third reel and the Medallion symbols on the second and fourth reels, the re-spins get activated and players will receive five re-spins with the wild frozen in position. This feature can be re-activated and players can get two re-spins by getting the Medallion symbols again on the second and fourth reels. The appearance of three Blood Vial symbols on the first, third, and fifth reels activates the Pick the Blood Bonus Game, in which players will be prompted to select vials of blood to reveal free spins or cash prizes. However, players will not be allowed to choose anymore if the blood explodes. Instead, they can start playing their free spins with doubled wins. Players can win up to 50 free spins in this game. If players land at least two Wild Blood Logo scatter symbols during the free spins feature, the multiplier value will increase by one up to x5. The optional gamble feature gets activated as soon as players hit a winning combination. If players choose to activate it, they can either double their winnings or lose them all. Wild Blood slot is available for fun or real money at any online casino that offers PlayNGo games.